The conference aimed to raise awareness about Cyprus as a global business and investment destination to a wider investor audience through a prestigious, high caliber, high impact event in New York City. 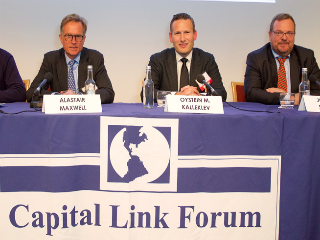 The Forum was organized at the initiative and active support of the Cyprus Union of Ship-owners and in cooperation with the Cyprus Investment Promotion Agency. Hellenic Bank was the Lead Sponsor, while Deloitte and EY were the Grand Sponsors. It featured the developments and reforms in the Cypriot economy and the Cypriot government's program for the economy and investments. Being the keynote speaker, President Anastasiades, outlined his Government’s commitment to facilitating business and investment relations between Cyprus and the United States. He referred to Cyprus’ remarkable economic turnaround, as the result of prudent management of public finances, the adoption of measures which facilitated economic and investment opportunities, various significant structural reforms, as well as the recapitalization of the banking system. He further underscored that financial institutions diligently implement corporate governance policies and have stepped up efforts to combat money laundering. American investors could be assured that the Republic of Cyprus provides investment security and protection, due to its full compliance with European and international standards, and could benefit from the comparative advantages Cyprus has to offer. The President highlighted that two weeks ago international rating agencies, had upgraded the rating of the Cyprus economy to “investment grade”, after being downgraded to “junk” seven years ago and following successive upgrades thereafter. The development demonstrates the positive economic outlook of Cyprus, enhances the trust of existing investors, and sends a strong message to new potential investors. Focusing also on the energy sector, President Anastasiades expressed his sincere appreciation for the involvement of U.S. companies in Cyprus’s exclusive economic zone for the exploitation of hydrocarbon reserves, and referred to recent significant steps, such as the signing of the Intergovernmental Agreement with Egypt for the exploitation of “Aphrodite” and the transfer of gas from Cyprus to Egypt, aiming at transforming the Eastern Mediterranean into an energy hub that would contribute to the region’s stability and energy security.